Sylvia and Gary James are two of the remaining residents of Denniston. At an altitude of 600 metres, it was one of the most isolated mining settlements in New Zealand, and has an alpine climate. Although the coal miners have moved away, Sylvia and Gary have great affection for the unique area where they live. Together they run Friends of the Hill, a group of people who previously lived at Denniston. As well as many other activities, Sylvia and Gary look after the Denniston seismograph, which records earthquakes in the Buller district. 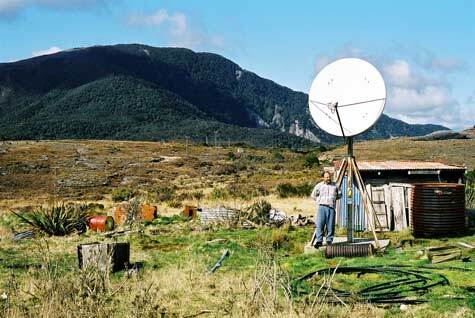 Here, Gary stands by the satellite dish that telemeters the records directly to GeoNet headquarters – a strange intrusion on the bare Denniston landscape. Mt William is in the background. Gary: We both have strong West Coast family ties. I was born in Westport, and can remember my grandmother telling me about her father who was a travelling shoe salesman. He used to visit Denniston once a fortnight – on the day when the miners were paid and had some money in their pockets. I have always been fascinated by Denniston. There is something special about it. I think that it’s the altitude. Once I walked up the bridle path and was suddenly surrounded by the fog – a marshmallow cloud that seems to me like a big security blanket. It’s a magical place to live. We have been here together since 1987, and our youngest child was born here. Gary: Friends of the Hill was formed in 1993, and now has two-yearly reunions here. Many people who lived at Denniston have deep affection for the place, and regard it as their tūrangawaewae [a place to stand, or home]. No-one can be buried at Denniston because the ground is too hard, but people often come back to scatter their parents’ ashes. We now have a special rock near the Museum with memorial plaques on it. Sylvia: We meet some fascinating people. As well as those who have lived here, or their descendants, we see groups interested in alpine plants and geologists looking at the rocks. And the popularity of Jenny Pattrick’s Denniston rose has made many more people aware of the town. We often have to explain that it’s a novel, not a true story; but everyone can understand how bleak it must have been to live here, especially for the women. My Father-in law's father Albert Millard lived in Denniston until around December 1921/ January 1922. Apparently he lived in the first house on the left after the dam. There was a shop nearby. He was a miner at Denniston. Another relative worked on the Brakehouse halfway down the incline. We are trying to put together further information on the family and would appreciate any further input.